I did something very stupid last night. I got home from work – tired – house a mess – dishes needing to be done – decreed that we’d be going to the nearby Mexican place for dinner. I woke up this morning at 4:40AM because our house alarm went off. It went off, the dog flew off the bed in a rage, and I almost FELL OFF the bed with him in response. It was about that time I discovered I was sick. Very sick. Should-be-capitalized sick. I took a pepto-bismol pill and moaned and groaned and had to stay in one position to prevent puking, but I went back to sleep and slept until 7:30AM. I apparently just can’t eat greasy stuff at all. The last time I was this sick – just last week – it was prompted by fried shrimp (I think). Jon fried with coconut oil, but it was oily nonetheless. Also? The food just about put me in a coma last night. I sat at the table and actually had a hard time following what Jon was saying because I felt drunk. From the food! I just can’t do it. My body is highly resistant now – to the point that I’m miserable afterward. I had no breakfast since I was feeling so horrible. I had classes to go to and I didn’t want to push my luck. I DO NOT throw up in public. 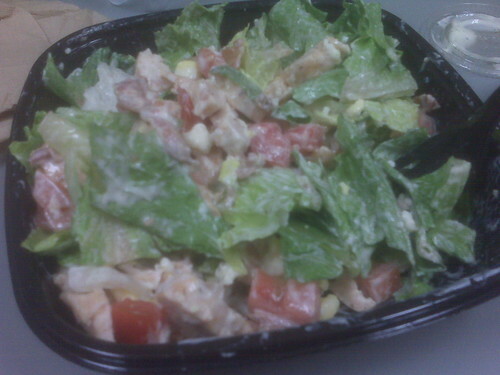 I didn’t pack my lunch because I was feeling whiny and sick, but I started to feel hungry around lunchtime – so I picked up a salad at quiznos. I ate about 3/4 of it before my stomach started hurting again. Jon made chili for dinner tonight. 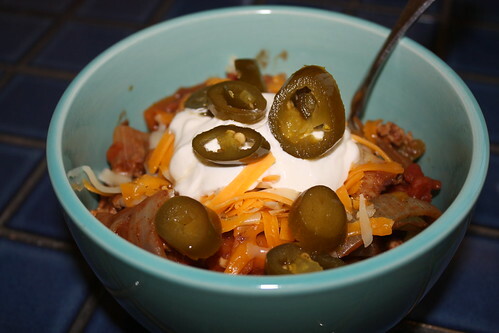 You might wonder why someone who just spent the day feeling sick would choose to eat chili with jalapeños on top – I’m wondering the same thing. Surprisingly – no issues. So far. Either way it turns out, it was damn good. He used yellow and orange peppers, an onion, tomatoes, black, kidney and pinto beans, garlic, black olives, a lb of turkey and some spices … it was very chunky. We added some pepperjack and cheddar … and sour cream … and jalapeños to the top. This is what almost knocked me out of bed this morning. 16 pounds. 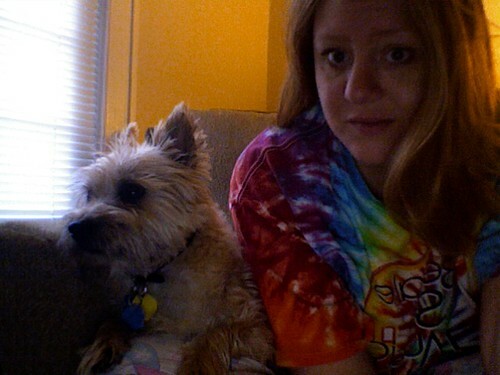 Notice the ears back – the way he’s leaning away from me? As if I’M the crazy one?